I started teaching food safety in 1999 at a culinary school in New York City. At first I wasn't sure how applicable information on microorganisms and time-temperature abuse was to the general population or the clients I saw in my private practice. 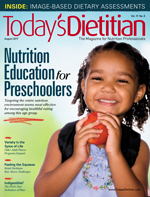 However, over time, not only did I find the information useful but I also determined it to be an important component that all nutrition professionals should incorporate into education sessions. The purpose of food safety education is to help prevent foodborne illness, a disease that's transmitted to people through food. The main culprits are pathogenic microorganisms that get into the food supply through poor personal hygiene, time-temperature abuse, and cross-contamination. Many cases of foodborne illness are avoidable, so educating clients on sanitary habits can help prevent illness. According to the 2013 NSF International Household Germ Study, more than 20% of foodborne illness outbreaks result from food that was consumed in the home. Specifically, improper food storage, handling, and preparation are what lead to illness. The study analyzed 14 common kitchen items for the presence of four microorganisms including E coli, Salmonella, Listeria, and fungi (yeast and mold). The kitchen items that harbored the greatest number of microorganisms included refrigerator vegetable and meat drawers, blender gaskets, can openers, rubber spatulas, and food storage containers with rubber seals. The microorganisms were found on kitchen equipment and tools that come in regular contact with potentially hazardous foods including meat, poultry, and seafood. According to a Centers for Disease Control and Prevention report, it's important to clean kitchen appliances and apply proper food safety practices to help prevent the spread of microorganisms. The report found that close to 46% of the 9.6 million cases of foodborne illness reported each year come from produce, defined as fruits, vegetables, and nuts. These foods typically are consumed raw and come in regular contact with the aforementioned kitchen equipment. • Refrigerator drawers: If possible, remove the drawer from the refrigerator. Then, remove all the food inside and wash the bin thoroughly with a clean sponge or cloth and mild dish detergent mixed with warm water. Rinse the bin with tap water and dry it. If the drawer has an odor, wash with 1 to 2 tablespoons of baking soda mixed with 1 quart of water, and then wipe dry. Repeat monthly. • Blender gasket: After unplugging the blender, take all the pieces apart and either wash them in the dishwasher or clean them with warm, soapy water. Warn clients to be careful not to cut themselves on the blade. • Can opener: Place a dishwasher safe can opener in the dishwasher after each use. To hand wash, wash the can opener in hot soapy water, rinse thoroughly, and dry. Use a stiff bristled brush to clean the food residue around the blade. • Rubber spatula: If dishwasher safe, wash it in the dishwasher after every use. To hand wash, use warm soapy water and clean between the handle and the spatula head. If it's a two-piece spatula, separate the handle from the spatula before cleaning. • Food storage containers: If the lid and container are dishwasher safe, wash after every use. To wash by hand, use hot soapy water, making sure to clean the area around the seal and any grooves where the cover attaches to the container. Rinse thoroughly and air dry. Based on the NSF International Household Germ Study, there's a need to educate clients about common household pathogenic microorganisms, specifically E coli, Salmonella, Listeria, and fungi. The following is an overview of each. Consuming only a small amount of these bacteria can result in hemorrhagic colitis. E coli produce toxins in the intestines, which results in illness. Common symptoms include diarrhea, which eventually becomes bloody; abdominal cramps; and, in severe cases, kidney failure. Foods commonly linked with these bacteria include ground beef and produce. To prevent this foodborne illness, suggest clients cook foods until they reach their proper minimum internal temperature, especially ground beef (which is 155° F). This involves having clients purchase a food thermometer and teaching them how to use it. It's also imperative to educate clients on how to prevent cross-contamination, specifically between raw meats and ready-to-eat foods. Review how to store ready-to-eat and cooked foods above raw meats. Ingesting just a small amount of these bacteria can result in salmonellosis. The severity of symptoms depends on the individual's health and the amount of bacteria consumed. Common symptoms include diarrhea, abdominal cramps, vomiting, and fever. Foods commonly associated with the bacteria include poultry, eggs, dairy products, and produce. To prevent this foodborne illness, recommend clients cook poultry and eggs to minimum internal temperatures, which are 165° F and 145° F, respectively. Educate them on how to prevent cross-contamination between poultry and ready-to-eat foods. For example, clients shouldn't wash raw chicken in the kitchen sink (as recommended in the 2015–2020 Dietary Guidelines for Americans) before cooking because the juices can splatter inside the sink and on the counter, causing Salmonella to spread. Unlike most bacteria, Listeria monocytogenes grow in cool, moist environments. The illness usually affects those with a compromised immune system, such as pregnant women, in whom a miscarriage can result during the third trimester. Foods most commonly linked with these bacteria include raw meat, unpasteurized dairy products, and ready-to-eat foods including deli meat, hot dogs, pâté, and soft cheeses (eg, Brie). To prevent this foodborne illness, remind clients to cook meat to their minimum internal temperature and prevent cross-contamination between raw and undercooked food and ready-to-eat foods. In addition, high-risk populations should be strongly encouraged to avoid unpasteurized food products. Molds are fungi that are transported by air, water, or insects. Although they're visible with the naked eye, they have branches and roots that can grow deep into the food. Some molds can cause allergic reactions and respiratory issues. Under the right conditions, several types of mold can produce illness-causing toxins. Molds prefer warm temperatures; however, they easily can grow in your fridge. They like salty and sugary foods, including cured meats and jam. Although the saying goes "when it doubt, throw it out," not all moldy foods need to be tossed. Hard cheeses and hard produce such as carrots, bell peppers, and cabbage don't have to be discarded. To remove the mold, cut off at least 1 inch around and below the mold spot. After cutting, use fresh wrap to cover it. Yeast can spoil food quickly and result in food with an alcoholic smell or taste. The yeast may appear as a pink discoloration or slime. They tend to grow well in acidic foods such as jams, honey, and fruit. If a client suspects that a food contains yeast, the entire container should be discarded. The following three main food safety practices can prevent all the illnesses described above. The tips provided below can be incorporated into education sessions with clients. The transfer of microorganisms from one surface to the other easily can occur when using the same cutting board and surface to prepare raw and ready-to-eat food. It also can occur if raw meat is stored above ready-to-eat or cooked food in the refrigerator. To prevent cross-contamination, remind clients to wash cutting boards thoroughly with soap and water between handling raw meat and ready-to-eat food. They also can use two separate cutting boards. Synthetic cutting boards can be cleaned in a washing machine and should be changed if they become warped or have many cracks and crevices. When storing food in the refrigerator, raw meats should be placed on the bottom shelves, while ready-to-eat and cooked foods should be stored on top. Foods that remain in the time-temperature danger zone between 41° F and 135° F for more than four hours can begin harboring pathogenic microorganisms. As a result, remind clients to refrigerate foods immediately when they get home from the market. Defrost foods in the refrigerator in advance and not on the countertop overnight. They also should cook foods until they reach their proper minimum internal cooking temperatures. Leftover foods shouldn't be kept at room temperature for more than two hours. Leftovers should be tossed after one hour when the temperature is 90° F or above. Clients always should handle food with clean hands and perform proper hand washing. They also should wash their hands after using electronic devices (eg, cell phones, laptops, desktop computers, iPads, etc), using the restroom, and performing other tasks such as taking out the garbage. If the person preparing food is sick with symptoms like diarrhea, vomiting, and sore throat with fever, they should avoid handling food until symptoms have resolved for at least 24 hours. Food safety practices are used in many areas of dietetics. Below are three RDs in different areas of practice who incorporate food safety into their work. "As a RDN and chef, I spend a large part of my time around food and cooking. One of the main areas of my business is private chef work for clients with a variety of health issues, so food safety is critical. Whether I am cooking in a client's home or in my home for delivery, I am sure to follow the food safety guidelines required in foodservice establishments. These include preventing cross-contamination; cleaning and sanitizing equipment, counters, sponges, and hands; and time-temperature control. "A large number of the kids we treat with the ketogenic diet for neurological disorders are medically compromised, so food safety and sanitation is a big concern. I spend a lot of time with parents and caregivers in our Research Metabolic Kitchen, and food safety precautions are a part of every lesson. It's usually straightforward information like proper temperature control, cross-contamination, and food and formula storage issues. But because we are a large hospital with a substantial immigrant population, it can sometimes be a challenge to explain food safety in a culturally sensitive manner, which is when a trained interpreter becomes your best ally." "I own a private practice, but work in an OB/GYN office in midtown Manhattan once a week as a prenatal RD. I always include food safety guidelines when counseling the moms-to-be. What I find most surprising is how most of my prenatal patients are so focused on or afraid of fish consumption, but then they go to juice bars or salad bars every day for lunch because they think they're eating healthful foods. I caution them about consumption of unpasteurized juices and prepared raw foods as part of the sessions." — Toby Amidor, MS, RD, CDN, is the founder of Toby Amidor Nutrition (http://tobyamidornutrition.com) and the author of the cookbook The Greek Yogurt Kitchen: More Than 130 Delicious, Healthy Recipes for Every Meal of the Day and the upcoming The Healthy Meal Prep Cookbook. She's a nutrition expert for FoodNetwork.com and a contributor to US News Eat + Run and MensFitness.com. 1. NSF International. 2013 NSF International Household Germ Study. https://www.nsf.org/newsroom_pdf/2013_germ_study_FOR-WEB-ONLY.pdf. Accessed June 20, 2017. 2. Painter JA, Hoekstra RM, Ayers T, et al. Attribution of foodborne illnesses, hospitalizations, and deaths to food commodities by using outbreak data, United States, 1998–2008. Emerg Infect Dis. 2013;19(3):407-415.